The Queen of Organization, Kimberly Clyde, is our get-it-done girl. 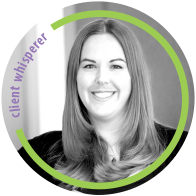 Not only is she dedicated to helping clients check things off their lists, she is committed to leaving no detail unnoticed. Her extensive experience in office and event coordination, market research, and promotional efforts have shaped her work ethic into the perfect combination of promptness, accuracy, and professionalism. Kimberly earned her Master of Arts in Communication from Virginia Tech and has lived in the Roanoke Valley for almost 10 years. After working in the media for most of that time, she is now focusing on growing relationships within the community and helping local businesses market their brands successfully. In her free time, Kim enjoys traveling with her husband and looking for new adventures. While nothing beats the cuisine from her hometown in New Jersey, she'll never pass up the opportunity to try new food with a local flair wherever she may be. Kim is also proud to be an animal lover and advocate. She'll tell anyone looking for a new fur baby to "adopt, don't shop!"